Biochemical engineers study changes in living things. Their goal is to use this information to create new medicines and products. Entry level jobs usually require a bachelor’s degree in biochemical or chemical engineering. Research and development jobs – including work with the government or in the for-profit sector – usually requires a master’s (M.S.) or doctorate (Ph.D.). Teaching jobs require a Ph.D. Because biochemical engineers often touch the business aspects of production, some advance their careers with additional graduate degrees in related fields or in business administration. Most chemical engineers work in offices or laboratories. Work sites might include industrial plants, refineries, and other locations. Biochemical engineers work in similar locations, with variation based on project type and employment sector (for example, a biochemical engineer working in food production may spend more time in agricultural settings than one working for a pharmaceutical company). Top areas for biochemical engineers to work in include basic chemical manufacturing, scientific research and development services, and production and manufacturing. Students planning to become biochemical engineers should demonstrate aptitude in sciences, math and engineering. The Technology Student Association (TSA) is a good place to begin research for middle and high school students. Successful biochemical engineers will be creative, inquisitive and analytical. They should be excellent at working both independently and in teams. Biochemical engineers examine data and process, attempting to create improvements at every level of production. They are also good at collecting, analyzing and modeling data. Look for work and internship opportunities that will develop and demonstrate these skills. Most entry-level jobs for biochemical engineers will require a bachelor’s degree. More schools offer chemical engineering degrees than biochemical engineering degrees. Pursuing a chemical engineering degree initially may offer more choice in universities and professional flexibility. Advancement in the profession may require advance degrees. For example, research directors and team leaders will often have master’s or doctorate degrees. It may be helpful to have a graduate in a professional specialty or business administration to advance in the profession. Graduate degrees are also necessary for teaching. Biochemical engineers can work on a wide range of exciting projects that affect human health and well-being. Assisting with medical research – such as figuring out how to grow large batches of cells for use in drug testing or improving on a cold medicine – is one important career option for biochemical engineers. Biochemical engineers also work in other important areas. For example, a biochemical engineer might be designing manufacturing equipment, improving the nutritional content of a popular snack, or developing an improved fertilizer for use in farming. Biochemical engineers often take scientific findings and figure out how to integrate them into products and medicines to help improve lives. Biochemical engineers study biology, chemistry, physics, biochemistry, and chemical engineering. What Does an Average Day Look Like For A Biochemical Engineer? Biochemical engineers deal heavily in data. A key area of focus may be data collection from testing, observation or research. Biochemical engineers must break down information into discreet parts, identify elements and drivers, and consider alternatives and the effects of changes in process and elements. In addition to analysis, biochemical engineers do a great deal of data processing. This can include compiling, coding, verifying, tabulating and auditing information. Biochemical engineers must stay current in their industries. Since scientific knowledge is ever-expanding, biochemical engineers must devote time to maintaining and developing domain expertise. Biochemical engineers rely on scientific and trade literature as well as conferences to stay abreast of technological advances. Biochemical engineers are often responsible for testing processes, improvements and systems. In this role, they develop, implement and monitor test plans. A key task of biochemical engineers is to develop and design processes for producing biological substances in large quantities (sustainable manufacturing). Process development is often iterative, requiring quantitative and qualitative test plans, incremental improvements, budgeting, equipment deployment and work planning. Biochemical engineers may be team leads or managing cross-functional teams. They must plan, assign and monitor work. As cross-functional team members, they will often be working with domain experts in their fields as well as production and manufacturing staff. Biochemical engineers routinely provide documentation and reporting on their work. This can include formal reports, routine status updates, informal emails, presentations, telephone calls and meetings. Biochemical engineers are expected to be competent in both written and oral presentation. The nature of engineering is to figure things out. Biochemical engineers are constantly examining products, processes, the environment and other factors with the goal of improving outcomes and output. This requires attention to detail, creative thinking, inventiveness and real engagement in problem-solving. Even biochemical engineers engaged in for-profit industries devote time to training and teaching. As process and improvement inventors, they may be tasked with identifying the educational requirements for production and manufacturing workers, documenting process, creating necessary training materials and providing instruction. Are You Suited for A Career As A Biochemical Engineer? Biochemical engineers have at least a bachelor’s degree in chemical engineering or biochemical engineering. They should be able to handle college level science, technology, engineering and math course work (STEM), as well as demonstrated aptitude for biology. Biochemical engineers must be able to stay current with science, technology and other industry developments. Biochemical engineers must be creative problem solvers. Difficult issues inspire them, and they are endlessly interested in how effects are created and changed. In one sense, they must be detached from outcomes, unafraid of negative test results, always willing to try something new to get to the goal. Biochemical engineers are tasked managing a great deal of data. They must be comfortable collecting, cleaning, entering, and analyzing data as well as drawing conclusions from data, and applying it to the problems they are trying to solve. Biochemical engineers think about all elements of product, process and systems. They must be skillful at conceptualizing, evaluating and applying information gathered from observation or reflection. They are able to stay clear and open-minded, making evidence-based decisions at every level. Biochemical engineers must be willing to focus on details at an extreme level, taking everything into account, documenting details accurately. Biochemical engineers work to solve difficult challenges. They contend with many variables and shifting conditions. They must not allow themselves to be discouraged by repeated failures or frustrations. Biochemical engineers usually work full-time, for a single employers. They interact with domain experts in fields outside of engineering. Entry-level biochemical engineers have bachelor’s degrees in chemical engineering or biochemical engineering. The American Institute of Chemical Engineers (AIChE) provides a full list of colleges and universities that offer chemical engineering degrees. While extensive, the list is not ranked. For students interested specifically in medicine, the College Board lists 173 more universities offering a biomedical engineering degree (a profession the BLS considers to be faster growing than chemical engineering). How Does A Biochemical Engineer Find Work? Most biochemical engineers are employed by private industry, though there are jobs in government as well. Biochemical engineers need a bachelor’s degree in chemical engineering or biochemical engineering to gain entry-level jobs in the profession. Internships and summer jobs can be helpful in securing future paid employment. Biochemical engineers can work in many fields, from medicine to food production. Work experience in targeted industries as well as chemical engineering can help job candidates position themselves for positions in biochemical engineering. Joining related industry organizations and attending meetings can be helpful for networking, staying current on developments and finding job leads. If career plans are to teach, lead teams, or head projects, it will be necessary to obtain a master’s or doctorate degree. 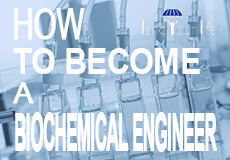 Degrees can be in chemical engineering or other related fields. What is the Average Salary of a Biochemical Engineer? Though the Bureau of Labor Statistics (BLS) doesn’t track biochemical engineers separately from chemical engineers, it does list the median annual wage for chemical engineers as $102,160 in 2017. According to PayScale, the average biochemical engineer salary is $78,611. What are the Job Growth Prospects for a Biochemical Engineers? Job growth estimates for chemical engineers are about 8% from 2016 to 2026, according to the BLS. This is as fast as average for all occupations. Despite this, demand for biochemical engineer’s expertise may be greater as chemical engineering is migrating into exciting new fields like biotechnology. For example, jobs such as medical scientists are projected to grow 13% for the same period, while medical lab technologists will grow 13%. Biochemical engineers with experience and advanced degrees will command the highest salaries and have the best job options. Biochemical engineers in hot growth fields (for example, medical research), may have more opportunities. The American Institute of Chemical Engineers (AIChE) has special sections including the Society for Biological Engineering (SBE), the Center for Chemical Process Safety (CCPS), the Center for Energy Initiatives (CEI), and the Institute for Sustainability (IFS). Founded in 1893, The American Society for Engineering Education (ASEE) attempts to further education in engineering and engineering technology. The Technology Student Association (TSA) is a national, non-profit organization of high school (and middle school) students engaged in science, technology, engineering and mathematics (STEM). The Biomedical Engineering Society (BMES) is devoted to developing and using engineering and technology to advance human health and well-being. The National Society of Professional Engineers (NSPE) advocates for professional engineers. The American Institute for Medical and Biological Engineering (AIMBE) advocates for the value of medical and biological engineering to society. The American Society of Agricultural and Biological Engineers (ASABE) is a member-driven and technical organization that offers members forums, conferences, networking and other resources. Many condition-specific associations and medical research associations have special interest areas for biochemical engineers.